Picturesque coastal village, noted for its fine 18th C. windmill. In the Middle Ages, it was a thriving trading port, exporting wool and grain. 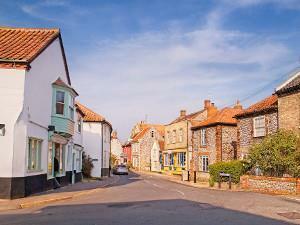 Narrow lanes and brick/flint houses, with galleries (arts/crafts) and specialist food shops. Magnificent church. The surrounding saltmarshes are one of the UK's premier bird-watching sites.